Winter is not quite over. But after a couple spectacular blizzards in mid January and February, New England has been enjoying some record-breaking warmth. Last Friday, the temperature reached 75° — beating the historical average for that day by a whopping 35°. I donned shorts and a tank top, slipping into the sandals I’d dug out from the back of the closet. And for one glorious day, it was summer. In fact, I chose one of the iconic symbols of summer time as the primary image for the cover of my first book, The Best Advice So Far. And it wasn’t just because I like the taste of lemonade. It’s more than that for me. It’s a symbol of hope, of childlike adventure, of making time for the important little things we so often tend to whiz by in life. 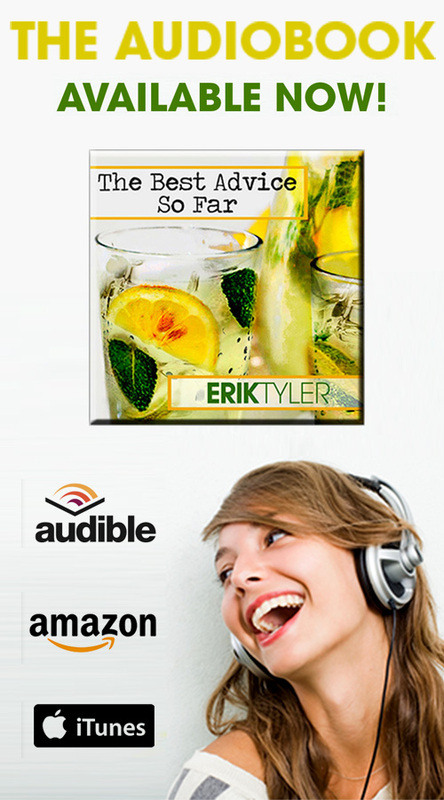 In my last post, I shared a sample chapter from the audiobook recording of The Best Advice So Far, for which editing is currently underway. Well, since my health, energy and focus have returned, I’ve also got my sights set on the next book. 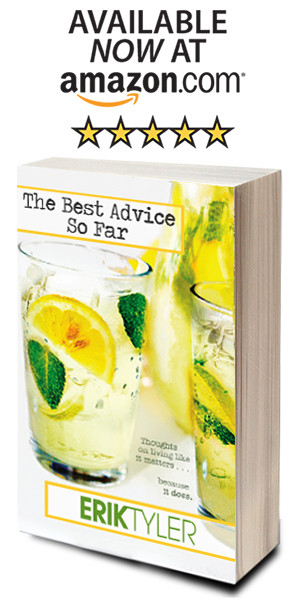 Before I’d gotten very far into writing The Best Advice So Far, I knew that lemonade would be the theme. And here again, as I plan the next book, I’m already all but settled on the imagery for its cover: sea glass. At the center of my mentoring, facilitation and everything I write is this statement: “You always have a choice.” And like lemonade, sea glass is about much more than what it appears to be on the surface. For me, sea glass represents choices. Below are just a handful. For many, the ocean itself is a symbol of vacation, of leisure, of rest. With me, it goes even deeper. There’s something about the slow, steady rhythm of waves along the shoreline that reminds me of the importance of being still. And if I walk beside them long enough, it’s as if they begin to whisper ancient secrets about things that really matter. Finding sea glass requires devoting time to actively doing nothing — totally removed from the often frantic pace of life. And that in itself tends to open us up to important reflection. We do not look for what we don’t expect — or at least hope — to find. And yet part of the fun of finding sea glass lies in the fact that it is rare. In other words, when searching for sea glass, most of what you find isn’t sea glass. It’s just sand. A vein of quartz in a stone. An opalescent shell. A glint of sunlight from a wet pebble. Hope is often deferred. And hope deferred builds patience. So you keep looking. And if you don’t find what you’re looking for today, you’re sure you will the next time. It all has a way of helping you remain on the lookout for the possibilities in life, even when no immediate evidence may have presented itself for some time. What was this a part of? Who was its original owner? How did it wind up in the sea? Was it part of a message in a bottle? Who else in history has touched this? What stories are held here? There’s just something about finding a piece of sea glass that keeps a sense of childlike wonder, curiosity and adventure alive and limber. The stark fact is that sea glass … isn’t worth anything. One could look at sea glass and see broken bits of garbage. And they wouldn’t be wrong. That is to say, the only value that sea glass holds is the value we ascribe to it. And what an important life perspective that is — the ability to see the extraordinary amid the ordinary, to both notice and find the beauty in things, experiences and people where others might overlook or dismiss them as useless or inconsequential. It’s no wonder, then, that those who are able to experience joy in the many simple and free pleasures in life find it easier to be happy more often. I write, speak and think often about the value in developing both the skill and resolve to find the silver lining in every situation. What better practice than sifting for hours through seaweed, sand and stones, determined to find the hidden treasure there? It should come as no surprise that so many of my closest friends are also collectors and appreciators of sea glass. So I not only see it in my own spaces, but displayed on the shelves and end tables and window sills and fireplace mantels of wonderful people who exemplify living like it matters. It provides all the more prompts to focus on the positive, as well as being a reminder of the choices I’ve made thus far in life to surround myself with other positive people. It’s my hope that you found some inspiration, motivation or encouragement here. Even if sea glass doesn’t happen to be your thing, I encourage you to seek out your own little everyday reminders to continually choose happiness. 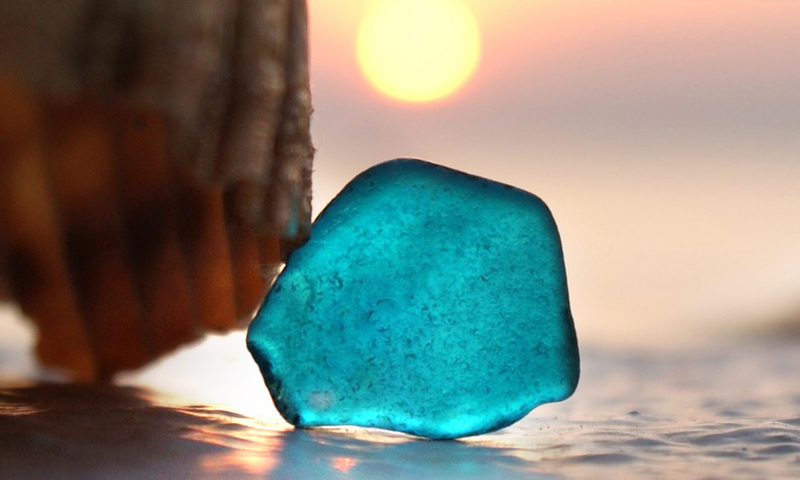 And just maybe, the next time you chance across a piece of sea glass — you’ll see something more. Thanks for stopping by, reading and sharing your thoughts, Jaye. Glad to meet a fellow sea glass lover. This sounds like its going to be a great book, Erik. I can’t wait to read it. I love the idea of slowing down. A strange thing I’ve noticed is that by slowing down and noticing more, time also slows down. It seems contradictory, doesn’t it? But living in the moment, adds moments to the string of time. I also love the line,”the only value that sea glass holds is the value we ascribe to it.” True of so much in life, and a perfect way to use our power of choice. Happiness often arrives when we reprioritize our values and chose to appreciate all the beauty, love, friendship, and choices available to us. When you mentioned sea glass as a symbol, it made me think of something we used to do with grieving families. When we welcomed them into our groups we had little welcome bags full of symbols that we’d explain as they browsed the bag. Among the items, we included a rough stone (like sharp glass) and we’d talk about how ugly and rough the process of grief is. We’d also include a beautiful, smooth, tumbled stone (like sea glass) to show the result of the tumbling personal journey that softens the edges, smooths the hurt, and returns beauty to life. I think that often, not just with grief, but with many of the harder parts of life, we have the ability to make choices, to grow and to soften, smooth, and bring out the beauty. I am so excited for this book! Lovely post, my friend. Diana, I don’t know if you recall my post from summer before last, entitled “i am here”; but, yes, I’ve also noticed that slowing down and living in moments is what makes time feel like it did when we were kids on summer vacation. I’m so glad you took the time to share your experience with the symbols of the grief process you shared with families. You’ve given me yet another way to look at sea glass, as well as to encourage someone else with it as a gift when the time comes. Thanks also for your continual support and enthusiasm, including about getting into this next book! My pleasure. I enjoyed the reminders. Your post is beautiful, Erik, and a wonderful reminder to slow down every day. I’m just back from a glorious vacation/retreat in warmer climes, where my guy and I still worked (I wrote 2-3 hours every day, he did his client work via laptop) but we also watched the sunrise every morning outside with our tea, took 1-2 hour walks daily, ate leisurely dinners in our small villa right after ogling the sunset, and read every night with little TV. My heart slowed down as the pace did. I wondered – why can’t we live like this all year round? Why, indeed? And Diana, I love the bag of symbols you talk about here – metaphorically lovely. 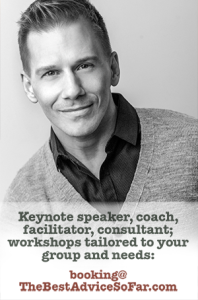 And from there, Erik and Diana – thanks for recommending Erik’s book on The Best Advice. My friend who is a new widow drank it up thirstily, and now she’s recommended it to friends in her Alzheimer’s support group. I love the way we circle our words/hopes/faith in and around each other. What an encouraging and thoughtful comment, Pam. Thank you! I’m also amazed, as you’ve pointed out, how circles intertwine at what seems the right time. And I can’t tell you what good it does me as a writer and “people lover” to know that the book is doing some good in the hearts of people who need it. It’s honestly why I wrote it at all, and why I continue to write the blog. Knowing that the words are meeting the goal is always fuel to that fire. Finding sea glass, and contemplating the unknown history of a piece you’ve discovered, and even the time it took for the ocean to fashion it, all of that requires the kind of investment in — and appreciation of — time that’s fallen out of custom in our ever-on, fiber-optically connected digital world. Similar to scouring for sea glass, I enjoy the unhurried practice of roaming used bookstores — of breathing in the paper-scented motes of dust, browsing the fissured spines of the books, and walking out with a few that I know will probably take me weeks if not months of time, all told, to read. I was just thinking this morning, in fact, about how I’ve made an effort lately to watch less TV, but watch programs that really speak to or entertain me; I also read less, but really pay more careful attention to what I’m reading, even if it means finishing one book in the time it used to take me to plow through three. So, there’s been “talk” of Diana and I podcasting. I think your comments and hers combined should become a companion site to mine. You always add an angle that allows me to enjoy my own articles on a deeper level. I’m with you on the bookstore experience (as well as, for me, libraries). I don’t own a TV and I’m just fine turning my phone off for those “living inside my head” times. Maybe that means I myself am bygone and analog. Hey, whatever … I’m happy, right? You know, I think we’re probably all likeminded people — sensitive and self-aware — and we’re all willing to read each other’s posts carefully, consider them thoughtfully, and contribute to the “roundtable” discussion each one of us initiates. That takes a kind of time, too — more than many are willing to spend in this day and age. I always think of that scene in Smoke, where Harvey Keitel is showing William Hurt his “life’s work”: a photo album featuring the same picture of the same corner in Brooklyn, each one taken by Keitel at exactly 8:00 a.m. every morning over the course of more than a decade. Hurt is flipping through the pages politely, a little baffled by both the magnitude and monotony of the project. In his assessment that “every picture is the same,” he utterly fails to notice the changes in weather and season, and the different kinds of wardrobe and different kinds of people passing by the camera on a given day. He’s looking at it, but he isn’t taking any of it in. “You’ll never get it if you don’t slow down, my friend,” Keitel advises him. Hey, Sean! Just to be clear … the “talk” of Diana and I doing a podcast has only been wishful thinking, purely in fun (though I wouldn’t object to the reality if one of us ever hops coasts). I agree regarding likemindedness. I enjoy supporting and encouraging as many other writers of all kinds as I’m able; and some of those interactions just seem to wind up going a little deeper for whatever reasons. The Smoke scene is a powerful one, for sure. Whenever I ask someone how they are and they respond with some version of “SSDD,” I feel sad for them — that they are missing the tremendous beauty, variation and possibility each day brings for the sake of not slowing down and being intentional enough to notice (and create) the differences. Thanks, Patricia — a testament to lovely and great friends.